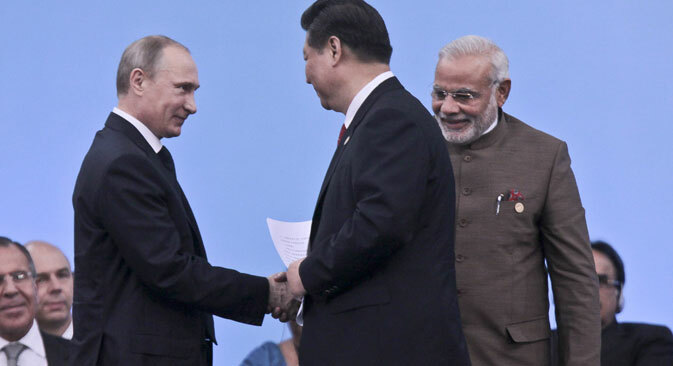 Russia and India are continuing their rapprochement. And it's not just about economic and political cooperation, but also about the common military strategy. Today, India is a unique Russian partner from a military point of view, according to Mikhail Alexandrov, leading analyst of the Centre for Military-Political Studies at Moscow State Institute. He spoke to Federal Business Agency Economy Today. India is not only the second largest market for sales for the Russian defence industry, but also an important economic partner. In recent years, both countries have been expanding their cooperation within the framework of such organizations as the SCO, BRICS and the United Nations. India is hoping to join the Shanghai Cooperation Organization (SCO), but it is already actively involved in discussing issues of military security and strategic cooperation, in view of terrorist threats, with Russia. Alexandrov said New Delhi and Moscow have a very close military partnership. These relations were outlined back in the 1960s, not long after India gained independence (in 1947). At the same time, the USSR began to supply arms. Then there was a cooling-off period, when the USSR and China enhanced their relations. But soon, regardless of China, the multifaceted cooperation was strengthened with the signing of a Treaty of Friendship and Understanding in 1970. “Essentially, this partnership is at a higher level than with any other country, because we sell India strategic weapons. We do not sell strategic weapons to any other country besides India. In particular, we give them nuclear submarines for rent. It is a level of cooperation that we have with no one else. Like, for instance, the United States helps England, the only country to which the US sells strategic weapons. Generally, selling strategic weapons is not common, there is a certain unspoken taboo,” Alexandrov said. So why is there such trust in New Delhi? Why not with Beijing, which we call our strong strategic partner? “On the one hand, India is a great power,” Alexandrov said. “On the other, we have never had conflicts with India, since there were no reasons for it. If you take other great powers in Europe or Asia (including China), we have had some serious differences, and potentially many countries may pose a threat to us,” he said. Alexandrov noted that Moscow benefits from India being a strong military centre in the multi-polar world, which influences the global strategic balance. That is why Russia seeks to help it. “It is in our interest that India is an independent, influential power pole in the world. I think that explains our broad military cooperation with New Delhi. Of course, there are also economic and political reasons to it,” said Alexandrov.